Sri Lanka’s Prime Minister Ranil Wickremesinghe had recently said that the Colombo Stock Exchange (CSE) will have smiles on their faces soon, referring to a possible return of biggest private sector workers’ pension fund - Rs. 2 trillion - EPF to the stock market, though with stricter new guidelines. “The CSE will have smiles on their faces soon” Prime Minister said. 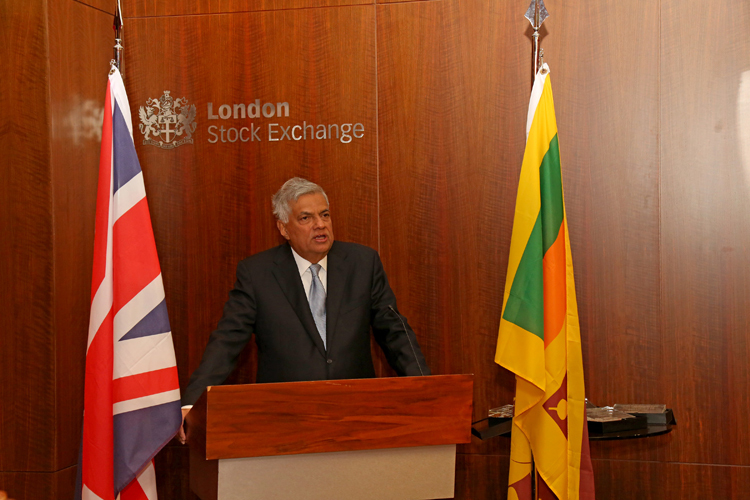 Prime Minister Wickremesinghe made these comments recently addressing reporters and audience when he inaugurated the trading of the London Stock Exchange (LSE) - one of the world’s oldest, which has a growing investment in Sri Lanka. Speaking after the opening of the LSE, the Prime Minister Wickremesinghe had said that Sri Lanka was living in a transformative and challenging time and the Government had decided to face it not by taking a step back but going forward on reforms and internationalization of the Sri Lankan economy. He had further revealed that the draft law for the offshore Colombo International Financial Centre was nearing finalization and further reforms were in the pipeline enabling more entrants to capital market. Speaking at the event he added that he was pleased by the cooperation between the LSE, which he described as one of the “hallowed institutions” in the UK, and the CSE.